One of the best things about starting a new year is thinking of new ways to revive your home. 2016 was inspiring, but we're excited to see what 2017 has to offer. From what we've seen so far, we believe it is going to be one of the most beautiful years yet! 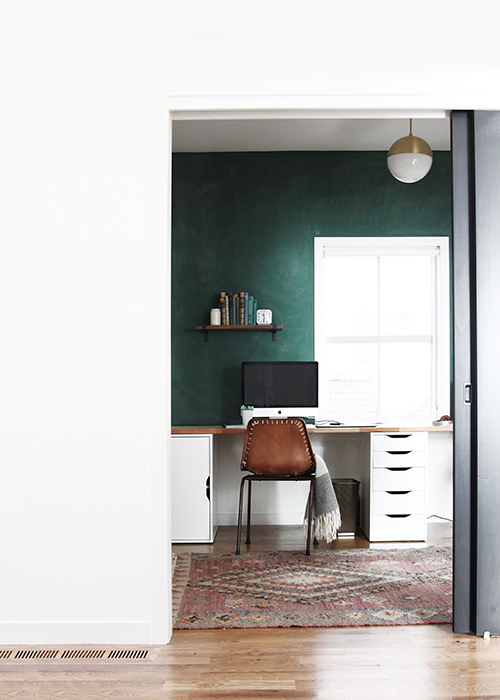 With that, we're glad to see our love for dark green becoming more prevalent in design this year. Just by painting your walls, or getting new furniture, you can incorporate this "trend." Please, take that word with a grain of salt. Unlike fashion, in the interiors world a "trend" can be around for a few years or even decades. Deep dark greens were all over in the 80s-90s and we're glad to see it coming back. What makes us so excited about this color is that it is the perfect statement color. We can't wait to incorporate this dark, moody color into our designs this year! Furniture is also a great way to incorporate green into your space. You can add a touch of luxe sophistication to your room by adding a velvet green sofa. Or you can try a dark green painted furniture piece. If you're feeling particularly wild, you can even do green leather chairs! Can't commit to paint or furniture? You can still use accessories to add a little dark green in your life.